The Babylonian astronomical diaries are a collection of Babylonian cuneiform texts that contain systematic records of astronomical observations and political events as well as predictions, based on astronomical observations. They also include other information such as commodity prices for particular dates and weather reports. Currently, they are stored in the British Museum. The Babylonians were the first to recognize that astronomical phenomena are periodic and to apply mathematics to their predictions. The oldest known significant astronomical text is Tablet 63 of the Enûma Anu Enlil collection, the Venus tablet of Ammisaduqa, which lists the first and the last visible risings of Venus over a period of about 21 years. It is the earliest evidence that planetary phenomena were recognised as periodic. 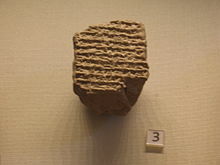 The systematic records of ominous phenomena in astronomical diaries began during the reign of Nabonassar (747–734 BC), when a significant increase in the quality and frequency of astronomical observations occurred. That allowed, for example, the discovery of a repeating 18-year Saros cycle of lunar eclipses. ^ a b Geller, M. J. (1990). "Babylonian Astronomical Diaries and Corrections of Diodorus". Bulletin of the School of Oriental and African Studies, University of London. 53 (1): 1–7. doi:10.1017/s0041977x00021212. JSTOR 618964. ^ a b Rochberg-Halton, F. (1991). "The Babylonian Astronomical Diaries". Journal of the American Oriental Society. 111 (2): 323–332. doi:10.2307/604022. JSTOR 604022. ^ A. Aaboe; J. P. Britton; J. A. Henderson; Otto Neugebauer; A. J. Sachs (1991). "Saros Cycle Dates and Related Babylonian Astronomical Texts". Transactions of the American Philosophical Society. American Philosophical Society. 81 (6): 1–75. doi:10.2307/1006543. JSTOR 1006543. One comprises what we have called "Saros Cycle Texts," which give the months of eclipse possibilities arranged in consistent cycles of 223 months (or 18 years). Links to translations of Astronomical Diaries: for 333-63 B.C.